The PUBMET conference has been my graphics playground since 2015, when I was hired to make a new logo and visual identity. Until now, the color schemes usually included combinations of blue and orange, with an exception of PUBMET2017 which was (although still predominantly blue and orange) sort of a transition to the new scheme of 2018. So why leave the comfortable safety of a tried visual identity and color scheme? The reason is primarily because I was never 100% satisfied with graphics from previous conferences. They always felt just “okay”. I decided to make PUBMET my playground again. I consider myself fairly comfortable with using all sorts of colors, but I could never make purple, pink, red, magenta and similar shades work. They always felt off. After so many years of avoiding that part of the color wheel, I decided to give it a go and travel into the unknown. I didn’t want to do it suddenly, so the first bits of PUBMET2018’s visual identity can actually be seen in 2017 materials such as nametags and flyers. This year, however, it’s full on and no holding back. 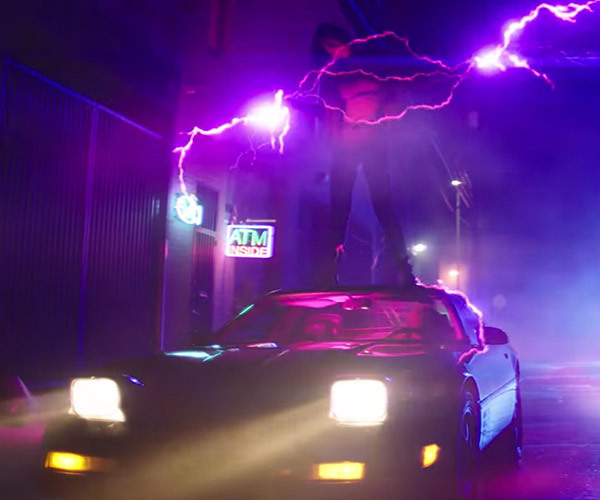 The new visual identity and color scheme is mostly inspired by retrowave, the 80s and color schemes of visuals from Star Trek: Discovery, Muse’s Thought Contagion music video and similar. Most of these inspirations were actually unintentional, as my subconscious must have picked up the colors through endless exposure to 80s and retro nostalgia on the Internet. The real trouble was finding the perfect background picture for graphic elements. Space and galaxy pictures were the first and only choice as they work both thematically (the vastness of space represents the openness of science) and visually (most of the background are dark-ish). The picture is still available as part of a freebie package which comes with an extended license. It fit amazingly with what I had in mind, has an insanely large resolution (3600x3600px) for use in large poster formats like B1 and scales equally well for smaller print applications like nametags and even works well for web promotional material. The new magenta logo also looked bloody great on it. Some weeks before PUBMET2017 kicked off, it was decided we would print out flyers reminding folk they can still make it to the conference – or visit us next year in Zadar. This is where the space picture first appears. However, I couldn’t yet decide and commit to a font for PUBMET2018, which is why the Ubuntu font used for PUBMET2017 was used on the flyer. Afterwards, a light sans font, Raleway, was used as it proved a great combination with the background and had all the necessary unicode characters for the names and surnames coming from all over the world. Thankfully, all that complexity still didn’t sacrifice the simplicity of the visual identity and readability of the poster. Bookmarks were made in Adobe InDesign because of their repetitive nature – a master consisted of just the background and the PUBMET logo. Quotes were then added on each page. This one was a real challenge. PUBMET2018 has a very uncomfortable number of presentations – not enough for multiple pages, and a bit too much for one page. At first, the idea I had was to have a larger part of the programme on one page, and the rest on one half of the back page. While that would mean I could use a larger font, I decided against it since it also meant a lot of turning back and forth for the participants and just general confusion. Instead, the programme was assembled together on just one A4 page, in landscape mode. The A4 paper would then be folded to make it look like an A5 leaflet. Four columns turned out to be just the right amount to get the largest font possible, which is 10,25pt. Decreasing the margins would have resulted in a larger font, but would also sacrifice the design, make it harder for participants to hold the programme without covering parts of it with their thumbs, and risk being too close to the trimming line. Therefore, the margins were left at the InDesign default of 12,7mm on all sides. This wasn’t enough to fit the programme on one page, however, so some trickery was needed. Leading was decreased to 10pt to squeeze in most of the text, and horizontal scale of the characters was decreased to 90%. The Raleway font has a bit of a quirk with its numbers: they have a lowercase and an uppercase version. The lowercase version is not baselined. While this works when surrounded by lowercase letters, it looked off in the programme, where numbers are mostly used to specify times and dates. Luckily, though, in this specific case, the problem was solved easily by tweaking the character style. The solution was to set figure style as “tabular lining” when editing the character style and that’s that. Unlike last year’s PUBMET2017 nametags, the PUBMET2018 nametags are in landscape orientation, so the design needed some tweaking and changing to do. Last year’s nametags already previewed the visual identity of 2018 conference. The new nametags put more focus and what’s really important: the participant’s name, this time with the same font size for both name and surname. which our hardworking students then cut out and place into badge holders. Since the nametags are something you can’t “waste” time on, as the situation and information about participants can change very quickly, data merge feature helps a lot. The information is changed in the text file, and generating the new layout as well as exporting to PDF takes no more than a minute. An 88-page beast was the toughest of all to tackle on. Most amount of work hours for the graphics ended up in the Book of abstracts, and the reason is very simple: it encompasses insane amounts of variation. Usually when designing and typesetting a book, it is written by one or two authors and you can adapt to their style of writing and the finicky things they do. For example, some people will create new paragraphs by pressing one Enter. Some will press two. Some will create indents, some won’t. Some use a ridiculous amount of italics or bold, some don’t use it at all. Some people like enumerated or bullet lists, others like to put a colon and list things in a single sentence. Some like tables, others like a lot of references and notes. And so on. All of these different styles need to be equalized. InDesign provides life-saving amounts of automation, but with so many authors, a bunch of work still ended up being manual. The final print version consisted of InDesign 29 documents, which were combined into a book. As was the case with bookmarks, Book of abstracts also makes use of masters. Multiple masters were made since one was needed for each type of submission: presentation, poster, keynote lecture, etc. This info is visible at the top, while the page number is generated automatically at the bottom when placed in the master (by inserting the current page number marker). Whether my little excursion into the unknown world of dark purple and magenta worked or not, I’ll leave for the participants of the conference to decide. Personally, I consider it my finest PUBMET work yet and one of my favorite works overall. A big shoutout to Iva Grabarić Andonovski, who caught the finest of mistakes in the materials and promptly warned me of them!